New to our range are these beautiful transparent plastic gem pieces. 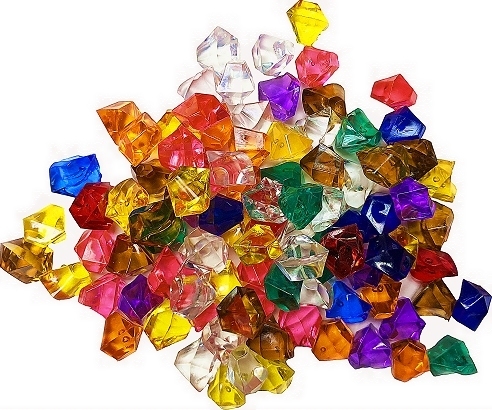 Available in all of our standard transparent colours mixed with clear plastic to resemble Diamonds, Rubies, Sapphires, Emeralds or any jewel of your choice. For more information about ordering the gems, prices, purchasing them in bulk or to get a sample sent out to you please contact our sales team to place an order through our contact page. The gems are approximately 10mm x 10mm x 12.5mm and have randomly curved surfaces with a highly polished finish to reflect the light and give a jewel like effect.